At BHS, we empower our students with the tools and knowledge required to succeed beyond high school. We are pleased to offer Advanced Placement, dual credit, and honors options to help them achieve their goals—wherever they may lead. 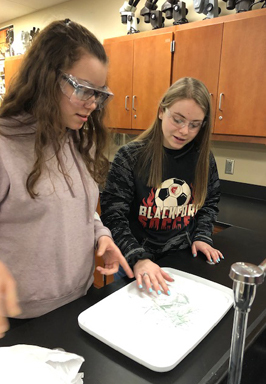 Advanced Placement (AP) courses engage students in intense discussion and collaborative problem solving and prepare students for higher level education. To earn the weighted grading scale at BHS, the student must take the AP exam. Students earning a test score of 3 or higher (out of a possible high score of 5) will receive college credit toward a degree at any Indiana public institute of learning. Most four-year colleges in the United States grant credit on the basis of test scores. Consult your chosen college for more information. BHS offers the following AP course options: World History, US Government and Politics, Physics I, and Studio Art. Dual credit allows students to earn both high school and college credits simultaneously. Students may participate in dual credit courses taught by high school faculty at BHS, college faculty at the college or university, or sometimes through online courses or distance education. Please refer to the course descriptions catalog for a comprehensive listing of dual credit options for BHS students.